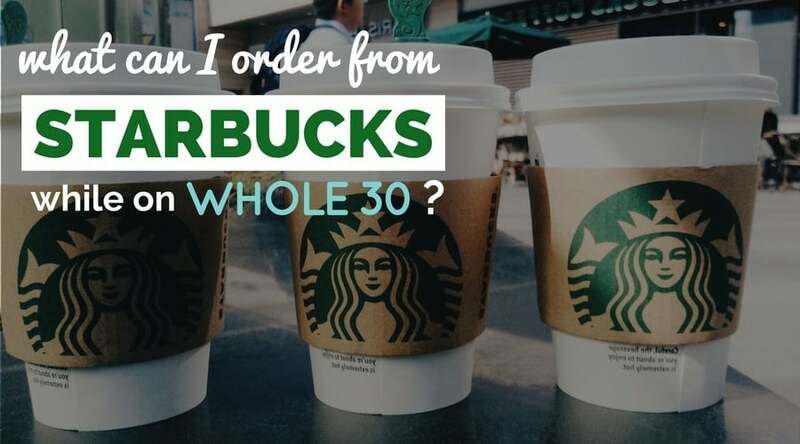 What Can I Order From Starbucks While On Whole30? While it’s pretty easy to brew up your own Whole30 compliant coffee drinks at home, sometimes when you’re on the run (or just feeling a bit lazy), a visit to Starbucks is in order. For many, a visit to Starbucks is a treasured part of the daily routine. There’s no reason to stop visiting while you’re doing Whole30, although your regular orders may have to go out the window for a while. Lattes and Frappuccinos are out, but there’s still plenty to order from Starbucks for those who can’t get enough of the siren stuff. We’ll show you what you can and cannot drink at Starbucks while on Whole30! What Is Whole30 Compliant At Starbucks? Standard coffee is compliant at Starbucks, just like it is at home.Many hot brewed teas past the test too. While you can’t sweeten up your coffees with syrup or milk, there are strategies for making compliant Whole30 coffee that packs some extra flavor punch. Bring your favorite compliant creamers to Starbucks and add them to your drink! Note: To be safe, we always recommend clarifying that you want your beverage unsweetened. Usually baristas will ask your preference if they offer sweetened and unsweetened versions, but it’s best to simply add “unsweetened” to your order to be safe. These teas are compliant, so long as you make sure to ask for them unsweetened, as the syrup they usually add contains sugar. Iced Black Tea. This tea contains water, a blend of black teas. Make sure to ask for unsweetend/no syrup. Iced Green Tea. This tea is an infusion of water, green tea blend, spearmint, lemon verbena and lemongrass. Again, be sure to ask for unsweetened / no syrup, since the syrup they normally add contains sugar. Passion Tango Iced Tea. The passion iced tea contains water, hibiscus flowers, citric acid, cinnamon, apple, licorice root, lemon grass, and fruit juice extract. As with others, get unsweetened to avoid the simple syrup that is added. Teavana Oprah Cinnamon Chai Tea (HOT). Contains no sugar, so you’re all set! However, be careful because the Oprah Chai Herbal Tea is not compliant – only the cinnamon version is. Pro Tip: Ask for a steeped hot tea and a large cup of iced tea to create your own guaranteed compliant iced beverage. Passion Tango Herbal Tea (HOT). Passion Tango Tea is infused with candied papaya pieces and candied mango pieces which include sugar, so this tea is out! 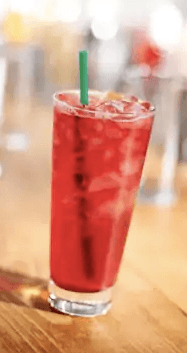 This can be confusing, since the iced passion tea is compliant (so long as you’re getting unsweetened). Peach Tranquility Herbal Tea (HOT). Peach Tranquility Tea is infused with candied pineapple as well as peach pieces with rice flour, so this tea is out as well. 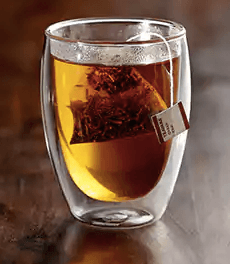 Oprah Chai Herbal Blend Brewed Tea (HOT). Contains Amaranth Grain, so it’s out. All Iced Teas NOT Listed Above. Don’t go near any shaken iced teas that are not listed above. Only the iced teas listed above are compliant (and even with those, make sure to ask for no syrup). Lemonades. There are several tea lemonade mixes (such as the Iced Black Tea Lemonade). None of the lemonade drinks are compliant, as they all have sugar. Other Coffees. No cafe latte, cafe mocha, cappuccino, macchiato, or mochas are compliant. Youthberry White Tea. Infused with candied fruit pieces, which contain sugar, disqualifying this item from the list. Shaken Berry Sangria Herbal Tea. Contains sugar. Strawberry Limeade Granita. Contains tons of sugar, most definitely out! No Frappuccinos. It probably goes without saying, but all Frappuccinos are out. Bottled Drinks. Bottled drinks are out. All contain sugar and/or preservatives. Refreshers. None of the Refreshers (Cool Lime, Strawberry Acai, and Very Berry Hibiscus) are compliant. Double Check Online. If you’re not sure about a specific Starbucks drink, be sure to check the Starbucks online nutrition menu, which provides complete details on each drink’s ingredients! Forget the Coconut Milk. While Starbucks does have coconut milk, it’s full of additives and isn’t compliant. Instead, bring your own compliant coconut milk from home or homemade almond milk! When Buying Packs, Read Labels Carefully. When buying tea (or any other drink) packs, make sure to read labels carefully, as ingredients can change slightly from what’s made on site vs. what’s sold in packs. Ask Questions and Repeat Back Order. Don’t be afraid to ask the barista questions if you’re not sure, and make sure to explain your order clearly and repeat it back. Navigating your way around Starbucks while on Whole30 can be a bit tricky, especially as ingredients and sourcing changes in the future. Here’s our take on staying safe. Even with changing ingredient lists and menus, it’s a pretty safe bet that these drinks will always remain compliant. Brewed Coffee, Americano, Espresso. These drinks are simply coffee beans + water, so they’ll always be compliant. Iced Coffee (Unsweetend). Iced coffee and cold brew are also safe bets, so long as you make sure that no sweeteners or syrups are being added. Baristas shouldn’t add syrup without asking you, but re-iterate to take extra precautions. You’ve worked hard – no reason to let a new barista mis-step throw you off track. Traditional Brewed Teas. Earl Grey, English Breakfast, and Green Tea are safe to go with. Just avoid any weird-sounding teas you’ve never heard of before. Do you have any strategies for ordering at Starbucks while on Whole30? What are your Starbucks Whole30 secrets? Share your advice in the comments! Starbuck Iced Passion Tea contains licorice root which is a legume. It is not whole30 approved. Hey Lyndsey – you might be thinking of the Teavana Oprah Cinnamon Chai Tea Latte – the latte is not compliant, but the regular tea should be. You can see nutritional info here: https://www.starbucks.com/menu/drinks/tea/teavana-oprah-chai-brewed-tea. No mention of steamed milk. Going on a Starbucks date while on Whole30. Thank you for posting this. Very doubtful that they use compliant almond milk. Tea and iced coffee recipes come standard and default with sweetener, so if you do not want it, you ALWAYS have to specify. Otherwise, it will be made to the recipe, as we are trained. Please be kind to your barista, and understand that we are always happy to accomodate, but just need to be clear on what your needs are! Thanks Tiffany! I’ve ordered Starbucks iced coffee many times and never have had syrup in mine, so I wonder why that is. Would it ever be so light in syrup that I wouldn’t taste it? Good to know that many default with syrup – even more important to ask then! What about Matcha at Starbucks? The matcha powder has sugar in it. Yup, sugar is part of the blend so matcha is out. What about a Pink Drink?? No, sorry, the Strawberry Acai base contains sugar. What about the defense wellness brewed tea?